What will happen if I decide not to get my roof cleaned? The integrity of your roof can be compromised by these roof staining organisms called gloeocapsa magma , which can actually attract animals to your home, and ultimately into your attic. Mold, mildew & algae can also penetrate the shingles allowing moisture to get into the sheathing & underneath the roofs surface. This moisture can cause wood to rot and the odor of rotting wood attracts critters and also creates a nesting place for small animals. Not only does having your roof cleaned give your house a polished look, but a thorough cleaning will also save you money in energy cost and will prevent long term interior roof damage while increasing the value of your home by bringing your roof back to a like-new appearance. Having your roof cleaned byKlean Roof can definitely save you money and it's cheaper than purchasing a new roof. An average 2000 square foot roof replacement can cost upwards of $11,000 - 17,000, while cleaning that same roof would cost less than $500! Many homeowners don't think they need to regularly clean their roof because their shingles comes with a warranty, but many shingle manufacturers actually suggest that you clean your roof. The truth about those ugly black stains on your roof! 1. What are the stains on my roof caused from? The stains are a form of a mold spore that is prevalent in our humid climate. Once planted on your roof it grows and spreads until your entire roof is coated with black mold stains. 2. Should I pressure wash my roof? Pressure washing is not recommended to clean roofs due to the high psi water pressure that can dislodge shingle granules and pit the tile glaze. We use a gentle chemical rinse that once applied provides cleaning results that last three to five times longer than pressure washing. 3. Should I have my roof cleaned in the winter or summer? With our technique we are able to clean during any season and we work around the weather to provide optimum results. Our chemicals are safe but if there is a light rainfall after the cleaning we recommend that you rinse your landscaping underneath the roof line. 4. Are my plants protected during the cleaning? We have very little runoff during our cleaning procedure and all plants underneath the roof line are rinsed thoroughly to prevent any damage. If there is a light rainfall on the first day of cleaning after we leave, simply rinse off your plants underneath the roof line. But if the rainfall is heavy you don't have to worry about rinsing the plants. 5. Will the cleaning take time before I notice it? While there are many different products available that will gradually remove the mold from your roof we have found that our method provides the best results. Hiring a roof cleaning professional is recommended since there are many things that can happen when you attempt to do it yourself. Our prices are reasonable and our training is more than squirting chemicals upon the roof. We are fully insured and provide our customers with the utmost of care when we clean their roofs plus the chemicals we use a much stronger than consumer cleaners. 6. Does my roof need to be replaced? If you are missing shingles, your shingles are more than 25 years old, there are no granules left on your shingles, tabs are flipping up or if the shingles are brittle, then yes, you likely need a roof replacement. However, just because your light colored roof is now streaked with solid black or has moss growing on it does not mean that you need a new roof. Rather, it most likely just needs cleaning. 7. Can I pressure wash my roof? Another likely source of damage is the pressure cleaning methods used to combat roof mold, mildew and/or algae growth. Pressure washing and harsh chemicals can cause rapid granule loss or other shingle degradation. As is the case with algal treatment, the pressure washing removal methods for roof mold may cause more damage than the growth itself. But this doesn't mean you would just leave the algal growth. 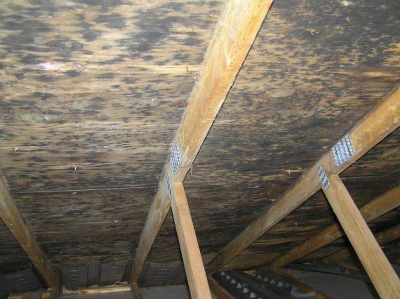 Take preventative measures to combat these growths since roof mold can be very destructive. 8. Can my insurance company cancel my policy if I don't have my roof cleaned? Insurance companies are increasingly demanding that homeowners have their roofs cleaned and they often only give you a very short notice to do it. There has been cases where the homeowner was given less than a week to comply or lose their insurance coverage. That’s why it is very important to be proactive and have those roofs professionally cleaned before you get that notice from your insurance company. 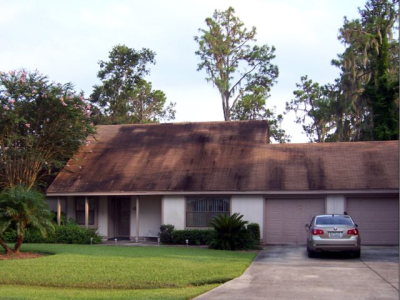 Insurance companies know that untreated roof stains will negatively impact the overall integrity of the roof, which can also lead to mold growth INSIDE your home. Roof stains are seen as ‘risks’ that could cost them money in a claim. 9. Can the roof mold affect my family's health? Absolutely! Having mold, mildew, moss, or algae growing on your roof is more than just an unsightly nuisance that brings down the value of your property. Each can cause roof rot and lead to health problems for people living in the home or residential complex, or for workers in a commercial building.